My specialty is to help people regain their strength, emotional balance and internal well-being. 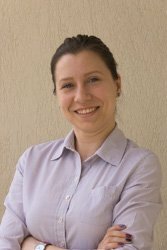 I am Valentina Dragomir and I am a psychologist and accredited psychotherapist by the Romanian Board of Psychologists and the European Association of Integrative Psychotherapy. My role is to help expats and temporary travelers to go through the difficulties they encounter in this new home country, Romania. In my work I also focus on helping my clients relieve their anxiety, depression, improve themselves and their relationships. I use the techniques of integrative psychotherapy to help my clients find the best solutions to their problems. I help them gain insight about the causes of their difficulties and access their potential to reach their goals. I collaborate with Romanian psychology and mental health sites such as Depresiv.ro, Motivonti.ro and Psychologies.ro where I occasionally write articles about psychology and personal development. I am member of the Romanian Board of Psychologists, the Romanian Association of Integrative Psychotherapy and the European Association of Integrative Psychotherapy. Integrative psychotherapy helps you become the architect of your own life, improve your relationships, feel better and heal. In other words, it helps you take your life back and live a fresh new lifestyle. It is my goal to create a comfortable confidential frame where we work together to help you reach your therapy objectives. Depression and anxiety are common difficulties encountered by people who move to a different country. Not treating them appropriately they can have a negative impact on the social life, daily routine and the ability to work. Depression and anxiety can be successfully treated through integrative psychotherapy. Integrative psychotherapy uses special methods to reduce anxiety and panic attacks. I frequently work with people who struggle with panic attacks or phobias and I help them regain control over their own lives. Jealousy, infidelity, lack of trust in partner or family members, are problems we may encounter in our relationships. Psychotherapy makes it easier to solve the problems that appear in relationships. It is common that people with a low self esteem have a negative internal voice. Self esteem, self image, self trust and self acceptance can be restored through psychotherapy. to create a live that looks good on the inside, not only on the outside. There are multiple reasons why we postpone seeing a therapist. It could be the stigma, not enough time, you name it. Let’s not prioritize these reasons over our mental health and wellbeing. Let’s not postpone anymore the emotional wellbeing that we deserve and start making steps towards our healing. Are you ready? The goal of PsihoSensus.eu is to bring psychotherapy closer to people and reduce mental health stigma.